Figure 3. Four Kurixalus species of Taiwan. A Kurixalus berylliniris sp. n. (holotype, adult, dark morph) B K. wangi sp. n. (holotype) C K. berylliniris sp. n. (sub-adult) D K. berylliniris sp. n. (adult, light morph) E K. eiffingeri F K. idiootocus. Two new species of rhacophorid tree frog were identified in Taiwan. In both new taxa, derived reproductive characteristics of laying eggs in tree holes and oophagous tadpoles are shared with Kurixalus eiffingeri, but they are divergent from each other in molecular genetics, mating calls, and tadpole and adult morphology. The morphological characteristics and the molecular phylogenetic evidence support the hypothesis that the two new species, Kurixalus berylliniris sp. n. and Kurixalus wangi sp. n., are both monophyletic lineages. Figure 1. Sampling localities of this study. Localities 1 through 22 are around Taiwan island, locality 23 from Iriomote isle, locality 24 from Ishigaki isle. The two isles belong to the southern end of Ryukyu archipelago. Color refers to the geographical distribution of the three Kurixalus species. Red: Kurixalus eiffingeri; Green: K. berylliniris sp. n. (Taxon 1); B: K. wangi sp. n. (Taxon 2). Loc. 20: Ligia, type locality of K. berylliniris sp. n.; Loc. 21: Shouka, type locality of K. wangi sp. n.
Figure 10. Phylogenetic relationship of all Kurixalus species from Taiwan. A phylogram showing the phylogenetic relationships of the four Kurixalus species, obtained by a maximum likelihood search based on 1207 nucleotides from mtDNA CO1 and 16S rRNA genes. 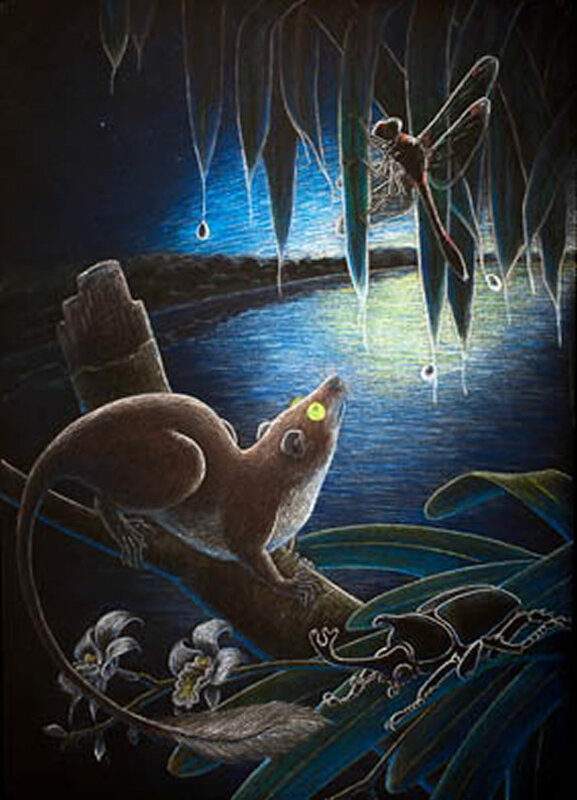 Feihyla palpebralis and Rhacophorus moltrechti were used as outgroups. The three values on each branch are maximum likelihood (ML), maximum parsimony (MP), and neighbor-joining (NJ) analyses with bootstrapping support based on 2000 replicates. Bootstrapping values below 50% are not shown. (JP: Ryukyu Islands of Japan; N. TW: northern Taiwan; C. TW: central Taiwan). Type locality: Ligia timber trail, 1250 meters above sea level, Taitung County, Taiwan, Republic of China (Fig. 1, Loc. 20, 22°49'26.79"N, 121°00'35.45"E). Diagnosis: A moderate-sized Kurixalus. Females average about 41 mm snout-vent length (range: 27.6–46.3 mm); males average about 35 mm (range: 29.0–42.3 mm). Iris emerald to light green. Two dark brown spots on eyelids, separated from each other and from X-shaped blotch on dorsum. Subarticular tubercles on foot rounded and flat. Belly and throat white or faintly-speckled. Prepollex in males squarish, compressed and expanded. About half-webbed between two outer toes. Anterior margin of tadpole dorsal fin extending to body. Tadpole heavily dark brown to black pigmented in gular region and on tail muscle. Upper lip of tadpole with deep transverse furrow, and prominent ridge extending from upper lip to anterior margin of nostril (key of tadpole, 3). Etymology: The epithet berylliniris is a compound word formed from beryllin (L.), green-colored, and from iris (L.), iris of the eye, and is treated as a noun in nominative singular in opposition to the generic name. Distribution and ecological notes: Kurixalus berylliniris sp. 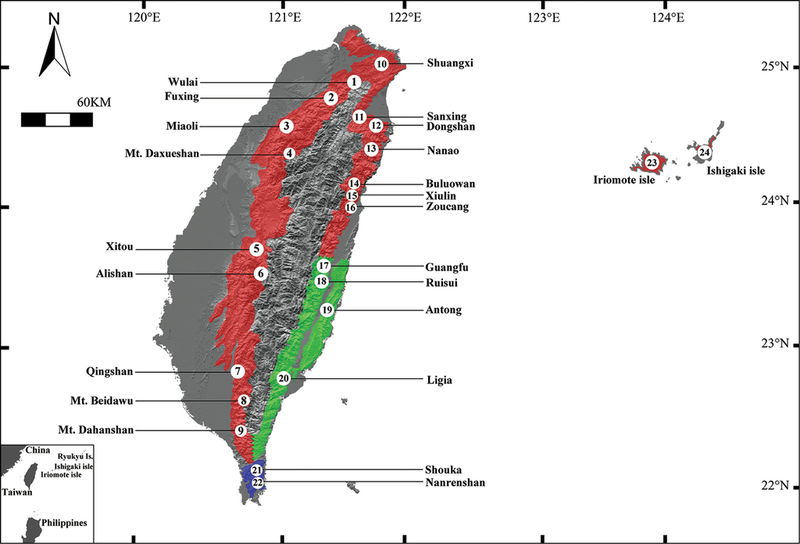 n. occurs in eastern Taiwan (at 225 to 1250 meters above sea level). The highest recorded elevation was on the eastern slope of the Central Mountain Range (Taitung County, 1250 meters above sea level), and the lowest recorded elevation was on the western slope of the Coastal Range (Hwalien County, 225 meters above sea level). Specimens were collected near the canopy level in moist broad-leaf forests in Taitung and on forest edges in Hwalien. The northern border of the specimen’s distribution was near the Guangfu township of the central Hualien County (Fig. 1, Green stain). Type locality: Shouka timber trail, 400 meters above sea level, Pingtung County, Taiwan, Republic of China (Fig. 1, Loc. 21, 22°13'15.58"N, 120°49'21.92"E). Diagnosis: A small to moderate-sized Kurixalus. Females snout-vent length averaging about 34 mm (range: 30.8–37.1 mm); males averaging 30 mm (range: 28.6–31.6 mm). Iris golden-yellow. Two anterior horns of the X-shaped marking on back extending to eyelid. Webbing extensive on toes, extending to the toe disc on the inner margin of toe V. Belly and throat whitish. Anterior margin of tadpole dorsal fin extending to posterior body. Tadpole with almost no pigment on region of tail muscle. Upper lip of tadpole with shallow transverse furrow. Etymology: The epithet is named and dedicated to Mr. Ching-Shong Wang for his pioneering work and contributions to the herpetology of Taiwan (Wang 1962). Mr. Wang discovered two rhacophorid frogs (Rhacophorus taipeianus and K. idiootocus) (Liang and Wang 1963, Kuramoto and Wang 1987) in Taiwan and suggested, in the early 1980s, that some Kurixalus specimens collected near the type locality of this new species might be different from K. eiffingeri (personal communication). The name is used in the genitive case. 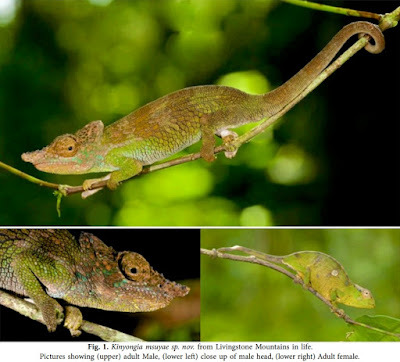 Distribution and ecological notes: Kurixalus wangi sp. n. is distributed in the southern part of Pingtung County in southern Taiwan below 500 meters above sea level (Fig. 1, Blue dots). All specimens were collected in the shrubs of secondary forests or lowland broad-leaved forests at low altitudes. Figure 4. Nesting sites of three tree-hole breeding Kurixalus species (a nest is made by the animal). A eggs of Kurixalus berylliniris sp. n. B eggs of K. wangi sp. n.; note that the parents were present with eggs C eggs of K. eiffingeri. As demonstrated by the high bootstrap support, the robustness of the phylogenetic relationship of the three rhacophorid genera is strong. Based on this robust phylogenetic tree, we found that the among-genera genetic distances were greater than the within-genus genetic distance (Fig. 10). Using the partial sequence of mtDNA CO1 gene as a molecular marker (Table S2), the genetic distances of the all pair-wise comparisons of the four Kurixalus species were all larger than 10% (Table S3). The phylogenetic trees constructed by Bayesian inference, NJ analysis, and MP methods showed the same topology (Fig. 10). The topology of branches was sufficiently supported by the posterior probabilities, bootstrap values, and branch lengths. 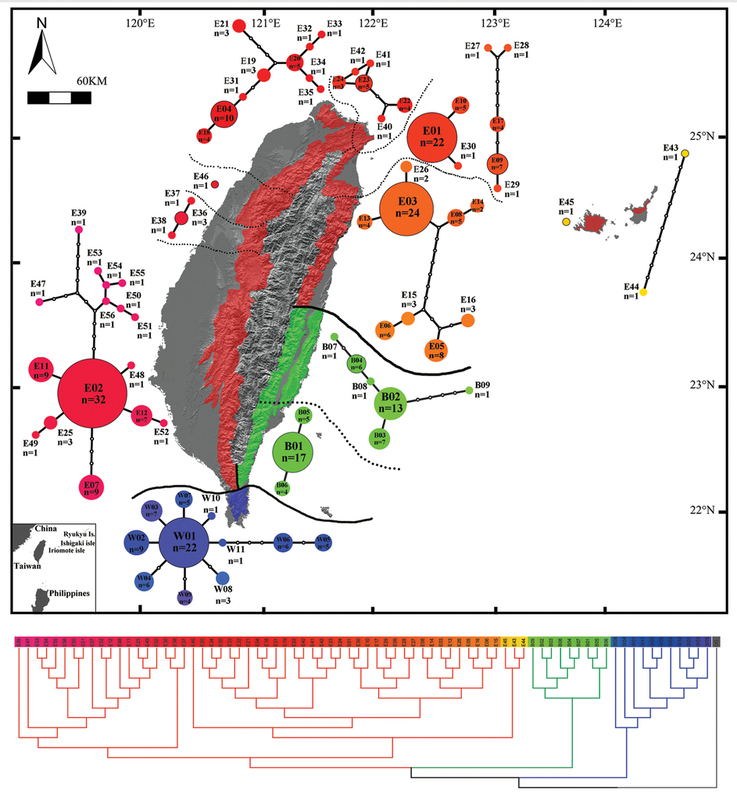 The four Kurixalus species of Taiwan formed a well-structured monophyletic group with distinguishable branch length. 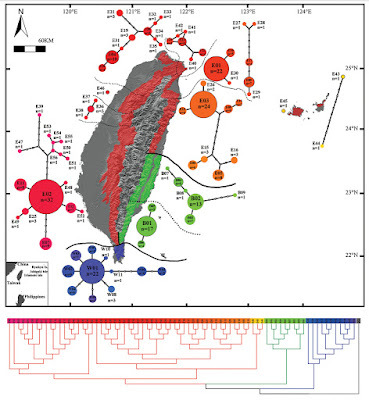 Samples of K. eiffingeri collected from Iriomote Island, northern Taiwan, and central Taiwan were embedded in the same lineage and formed a monophyletic group (Fig. 11 below). Individuals from southern (Kurixalus wangi sp. n.) and eastern Taiwan (K. berylliniris sp. n.) were sister taxa of K. eiffingeri. 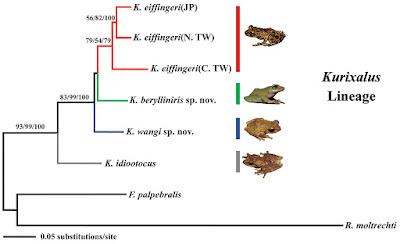 Kurixalus idiootocus was phylogenetically distinct from the three Kurixalus species (Figs 10 and 11 below). Figure 11. 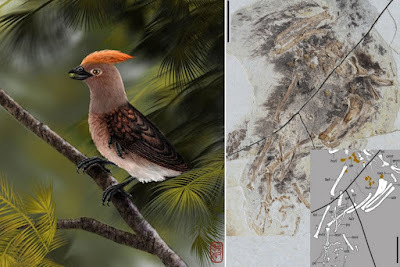 Geographic distribution and genetic structures of Kurixalus eiffingeri and the two newly discovered cryptic species from Taiwan and its two adjacent islands. Red: K. eiffingeri; Green: K. berylliniris sp. n.; B: K. wangi sp. n. Bold lines mark the boundaries of each species’ distribution, dotted lines discriminate different genetic groups intra species. Below: a consensus ML tree to show the variation between haplotypes. Shu-Ping Wu, Chuan-Chin Huang, Chi-Li Tsai, Te-En Lin, Jhih-Jia Jhang and Sheng-Hai Wu. 2016. 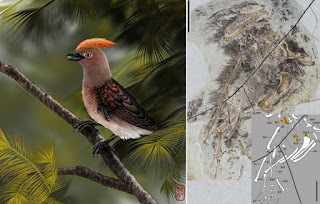 Systematic Revision of the Taiwanese Genus Kurixalus members with A Description of Two New Endemic Species (Anura, Rhacophoridae). The subfamily Murininae has high species diversity in Vietnam, but taxonomic studies are limited. 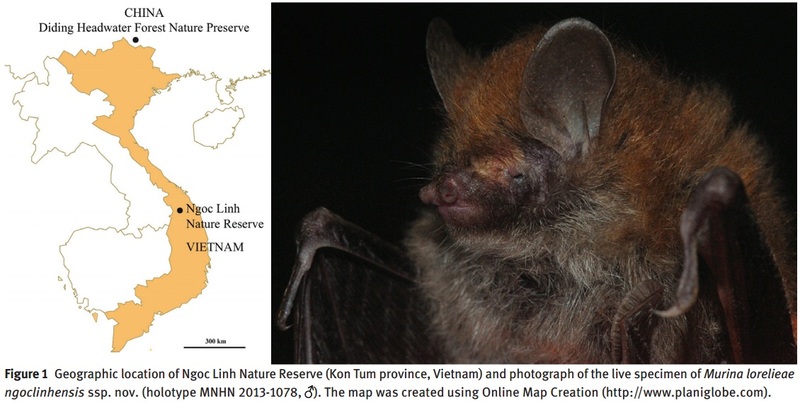 In this paper, we describe a new species of the genus Murina based on a specimen collected from Ngoc Linh Nature Reserve, Kon Tum Province in the Central Highlands of Vietnam. 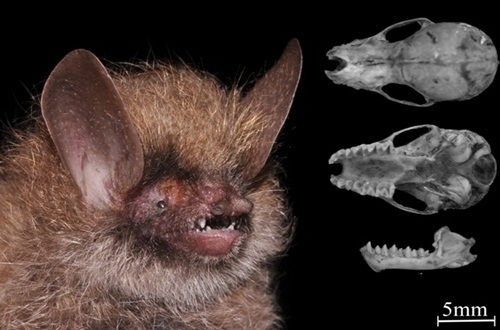 It is a medium-sized species with ‘suilla-type’ dentition. A taxonomic review of Murininae from Vietnam was also conducted based on combined morphological, DNA, and karyological characteristics. Molecular phylogenetic analyses based on the mitochondrial cytochrome coxidase subunit (COI) gene supported the subfamily Murininae, while the genus Murina proved to be paraphyletic in relation to the genera Harpiocephalus and Harpiola. Fourteen species of the genus Murina, one species of Harpiocephalus, and one species of Harpiola are recognized from Vietnam. Murina tiensa is regarded as a junior synonym of M. harrisoni; strong sexual dimorphism was observed in M. harrisoni. Relations between forearm length and total length of skullshowed different trends among species and sexes. Karyotypes of Murina huttoni, M. cyclotis, M. lorelieae, M. beelzebub, M. feae, and Harpiola isodon were 2n = 44, FN = 50, while that of Harpiocephalus harpia was 2n = 44, FN = 52. 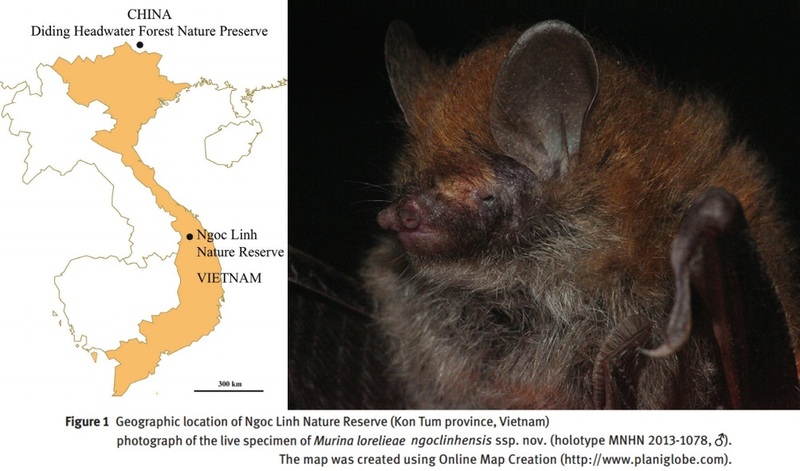 In 2011, three specimens from an unknown species of tube-nosed bat (genus Murina) were collected in montane moist forest at altitudes between 1117 and 1682 m in the Ngoc Linh Nature Reserve of Vietnam. We sequenced the mitochondrial COI gene from Ngoc Linh bats and performed comparisons with Murina sequences available in the nucleotide databases. The results suggested that the three unidentified specimens belong to Murina lorelieae, a species recently described from a single specimen collected in southern China. Nucleotide distances between specimens from Ngoc Linh and southern China are exceptionally low for M. lorelieae (1.25%) in comparison with three other Murina species, i.e., Murina cyclotis, Murina feae, and Murina huttoni (3.9–5.5%). We suggest that M. lorelieae is adapted to montane forests, which may have facilitated long-distance dispersal events between southern China and Vietnam during glacial periods of the Pleistocene. Morphological comparisons based on body-size measurements and geometric morphometric analyses of the skulls showed differences between Vietnamese specimens and the Chinese holotype of M. lorelieae. We proposed that the Vietnamese specimens belong to a distinct subspecies, Murina lorelieae ngoclinhensis. Vuong Tan Tu, Raphaël Cornette, Jose Utge and Alexandre Hassanin. 2015. First Records of Murina lorelieae (Chiroptera: Vespertilionidae) from Vietnam. 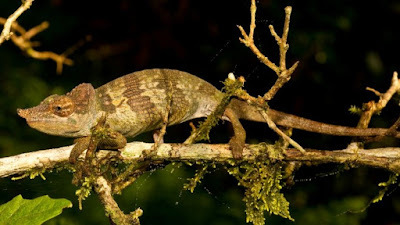 Treeshrews are widely considered a “living model” of an ancestral primate, and have long been called “living fossils”. 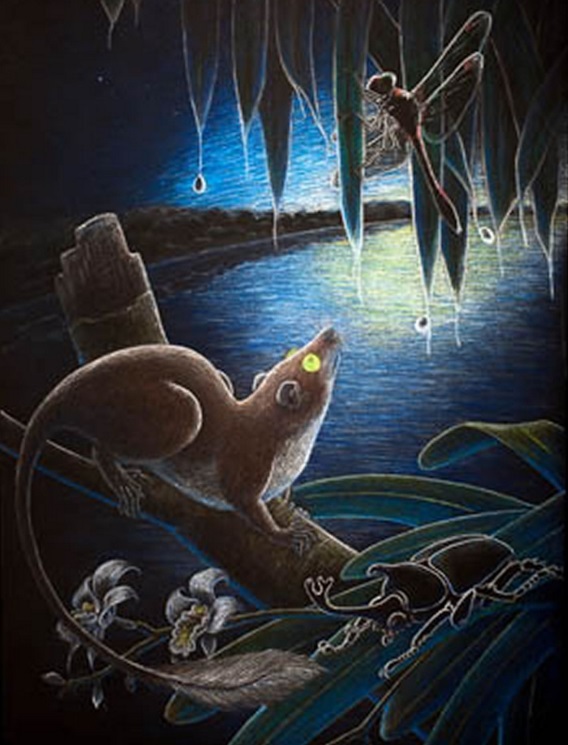 Actual fossils of treeshrews, however, are extremely rare. 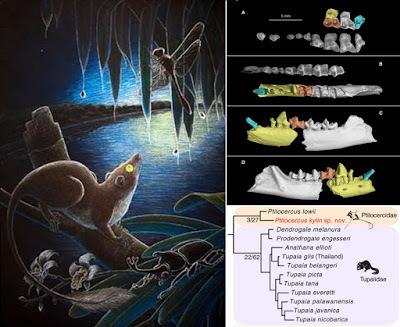 We report a new fossil species of Ptilocercus treeshrew recovered from the early Oligocene (~34 Ma) of China that represents the oldest definitive fossil record of the crown group of treeshrews and nearly doubles the temporal length of their fossil record. 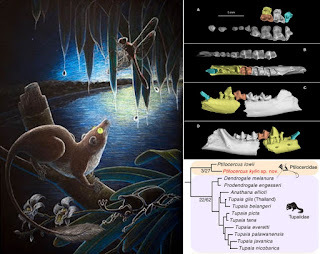 The fossil species is strikingly similar to the living Ptilocercus lowii, a species generally recognized as the most plesiomorphic extant treeshrew. It demonstrates that Ptilocercus treeshrews have undergone little evolutionary change in their morphology since the early Oligocene. Morphological comparisons and phylogenetic analysis support the long-standing idea that Ptilocercus treeshrews are morphologically conservative and have probably retained many characters present in the common stock that gave rise to archontans, which include primates, flying lemurs, plesiadapiforms and treeshrews. 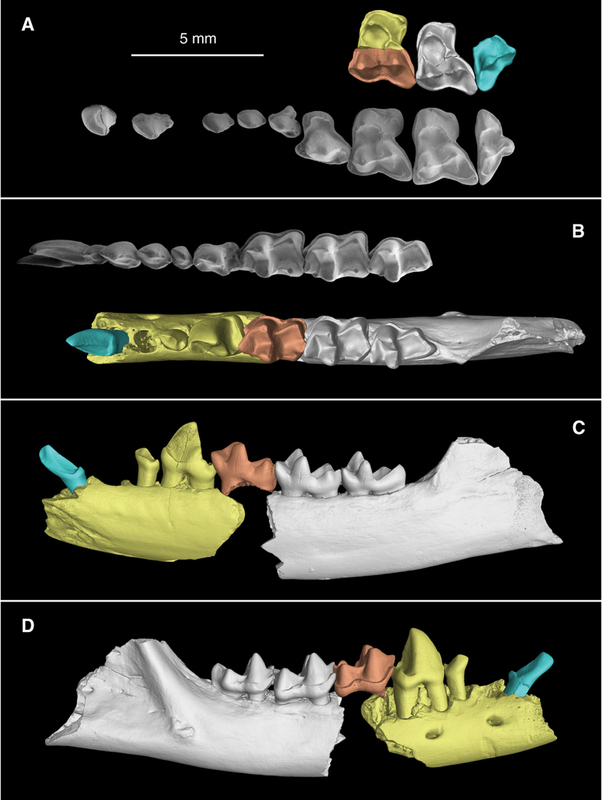 This discovery provides an exceptional example of slow morphological evolution in a mammalian group over a period of 34 million years. The persistent and stable tropical environment in Southeast Asia through the Cenozoic likely played a critical role in the survival of such a morphologically conservative lineage. Figure 1: Upper and lower dentition (in color) of Ptilocercus kylin sp. nov., compared with P. lowii (USNM 32409, in gray-scale). (A) Crown view of the upper dentition. Fossils include the lingual half of a left M1 (IVPP V20689, reversed), the buccal half of a right M1 (IVPP V20690), a complete right M2 (IVPP V20691), and the buccal half of a left M3 (IVPP V20692, reversed). I1-2, C, P2-4, and M1-3 are shown for P. lowii. (B) Crown view of the lower dentition. Fossils include an isolated right lower canine (IVPP V20693), a right jaw fragment preserving p3-4 and the alveoli for i2-3, c, and p2 (IVPP V20694), an isolated right m1 (IVPP V20695), and a right jaw fragment preserving m2-3 (IVPP V20696, holotype). The alignment of the fossils is based on a left lower jaw fragment retaining a small portion of the i2-3 alveoli, alveoli and roots of c and p2, and p3-m3 (IVPP V20699, Fig. 2 and Supplementary Information). The i1-3, c, p2-4, and m1-3 are shown for P. lowii. (C), Lingual view of the lower dentition of P. kylin. (D), Buccal view of the dentition of P. kylin. Scale bar equals 5 mm. Etymology: Specific epithet is derived from the name of Qilin District, in Qujing City. Qilin is the pinyin for kylin, a hoofed dragon-like beast of Chinese myth. 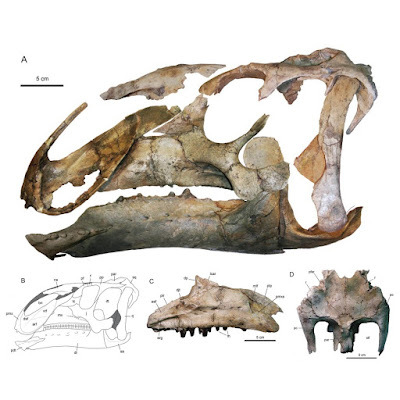 Holotype: IVPP V20696 (Fig. 1), a right mandibular fragment preserving m2 and m3. 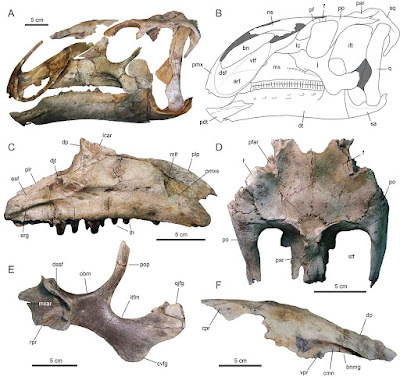 Locality and horizon: Lijiawa Mammalian Fossil locality, Yunnan Province, China. Earliest Oligocene, ~ 34 Ma. Figure 3: Summary phylogeny of treeshrews. 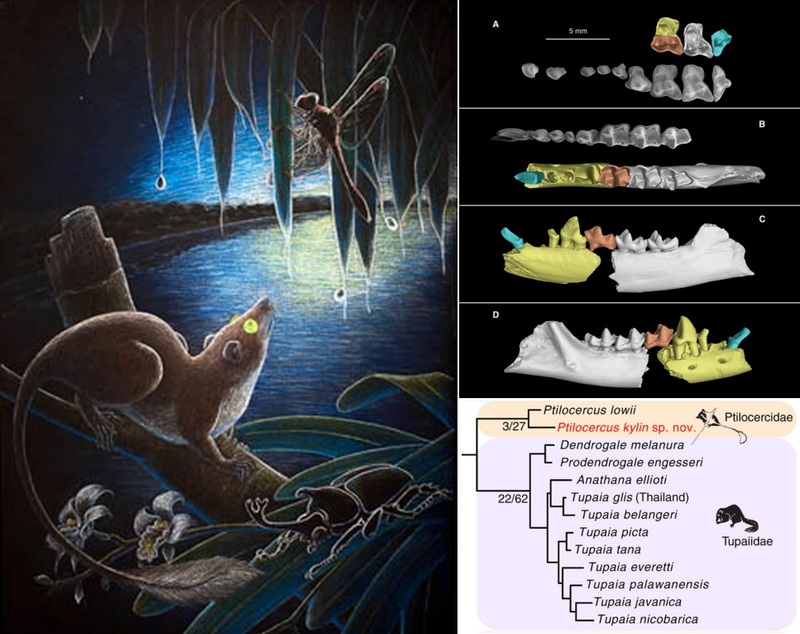 Figure 4: Ptilocercus treeshrew distribution in the context of southern Asia’s modern geography and early Oligocene palaeogeography. (A) Fossil locality of Ptilocercus kylin sp. nov. (blue dot) and the distribution of the living species Ptilocercus lowii (pale reddish shading). The background map is from: wikimedia.org (under the Creative Commons Share Alike license: creativecommons.org). (B) Fossil locality (blue dot) and reconstructed palaeogeographic distribution of the closed canopy of tropical rain forest and monsoonal forest (pale reddish shading) in the early Oligocene. The palaeogeographic reconstruction is from ref. 46 (Nature Publishing Group License: 3646200322068). The position of the fossil locality on the palaeogeographic reconstruction was estimated based on its distance from the Tibetan Plateau and the Sino-Burman Ranges (SBR). 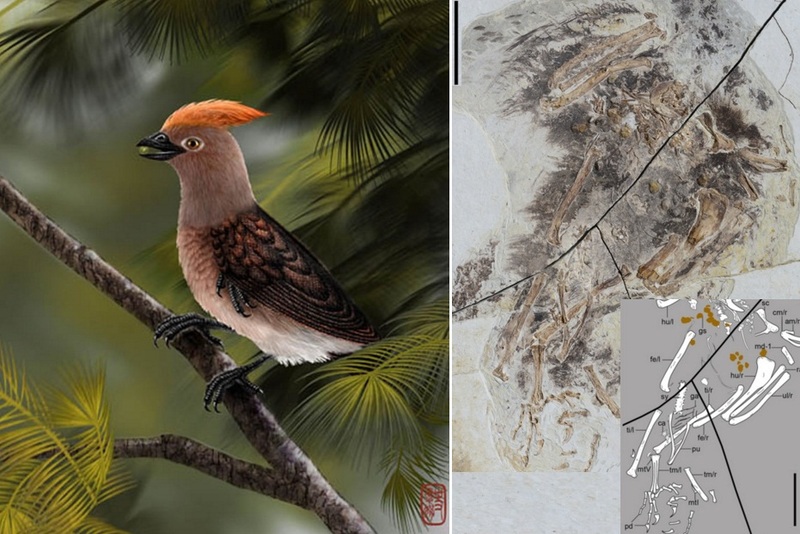 The Chinese Lower Cretaceous Jehol Group is the second oldest fossil bird-bearing deposit, only surpassed by Archaeopteryx from the German Upper Jurassic Solnhofen Limestones. Here we report a new bird, Chongmingia zhengi gen. et sp. nov., from the Jehol Biota. Phylogenetic analyses indicate that Chongmingia zhengi is basal to the dominant Mesozoic avian clades Enantiornithes and Ornithuromorpha, and represents a new basal avialan lineage. 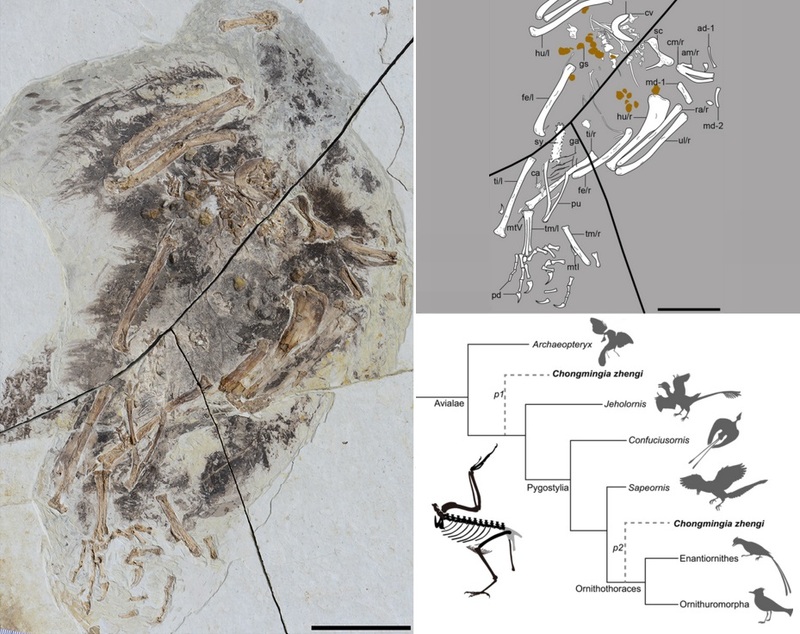 This new discovery adds to our knowledge regarding the phylogenetic differentiation and morphological diversity in early avian evolution. The furcula of Chongmingia is rigid (reducing its efficiency), consequently requiring more power for flight. However, the elongated forelimb and the large deltopectoral crest on the humerus might indicate that the power was available. The unique combination of features present in this species demonstrates that numerous evolutionary experimentations took place in the early evolution of powered flight. 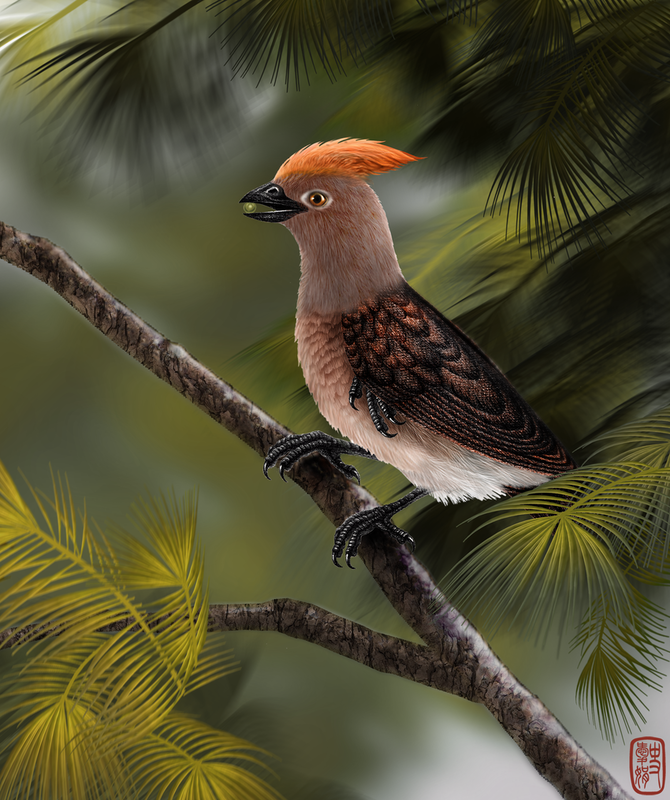 The occurrence of gastroliths further confirms that herbivory was common among basal birds. The Jehol birds faced competition with pterosaurs, and occupied sympatric habitats with non-avian theropods, some of which consumed birds. Thus, avialan herbivory may have reduced ecological competition from carnivorous close relatives and other volant vertebrates early in their evolutionary history. Chongmingia zhengi gen. et sp. nov.
Etymology: The generic name is from the Mandarin word Chongming, referring to a Chinese mythological bird. The specific epithet is in honour of Mr. Xiaoting Zheng for his generous contribution in the establishment of the Shandong Tianyu Museum of Nature. 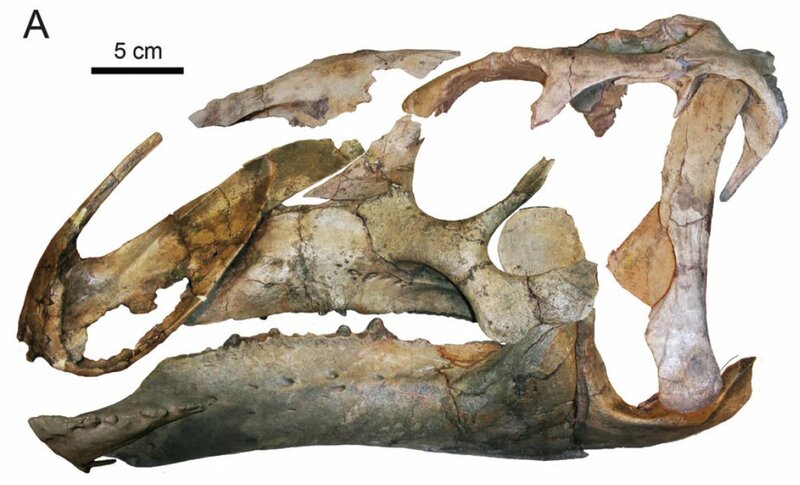 Holotype: STM (Shandong Tianyu Museum of Nature) 9-9, a partial skeleton with associated soft tissues and gastroliths, missing the skull and most of the caudal vertebrae (Fig. 1). Locality and horizon: Dapingfang, Liaoning Province, China; Jiufotang Formation, Early Cretaceous (Aptian). Figure 1: Photograph and line drawing of the holotype of Chongmingia zhengi gen. et sp. nov. (STM9-9). 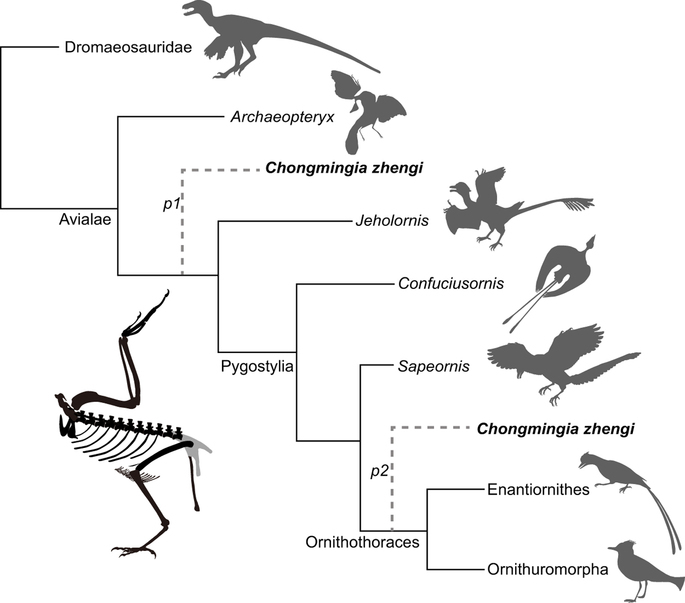 Figure 7: Simplified Mesozoic avian cladogram showing the possible phylogenetic positions of Chongmingia zhengi. 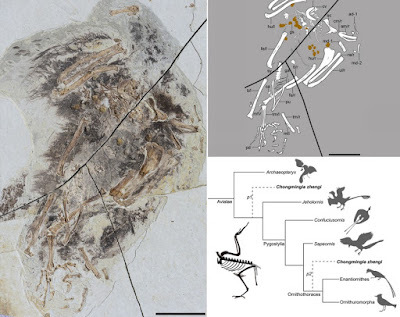 Analysis using the coelurosaurian matrix places Chongmingia within basal avialans and as the sister group to Ornithothoraces (p1), and analysis using the Mesozoic avian matrix resolves Chongmingia as the most basal avialan, except for Archaeopteryx (p2). Min Wang, Xiaoli Wang, Yan Wang and Zhonghe Zhou. 2016. 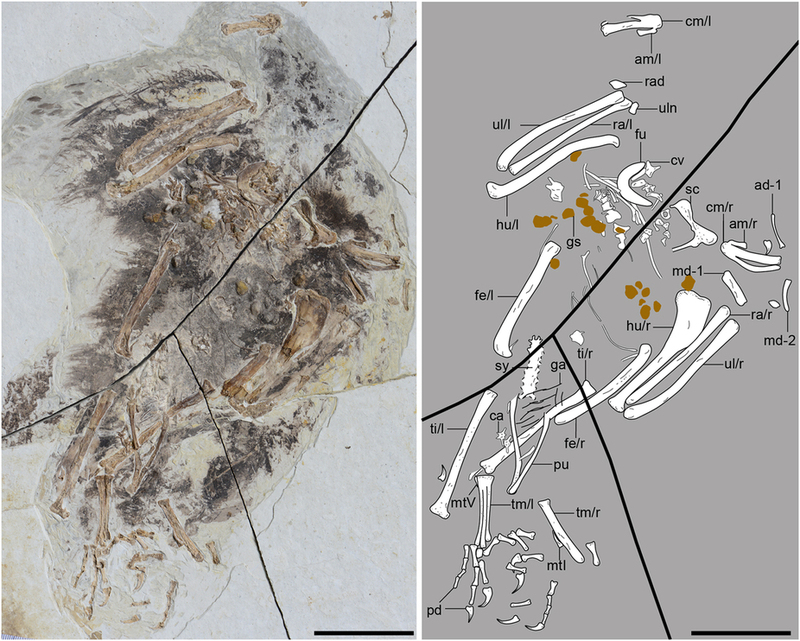 A New Basal Bird from China with implications for Morphological Diversity in Early Birds. Fig 6. Color pattern and reproductive comparisons between Pedostibes tuberculosus from India and ‘P’. hosii from Southeast Asia.
. (D) Vocalizing male of P. tuberculosus from India. (E) Amplectic pair of P. tuberculosus engaged in oviposition. (F) Film of eggs of P. tuberculosus floating in a stream pool. 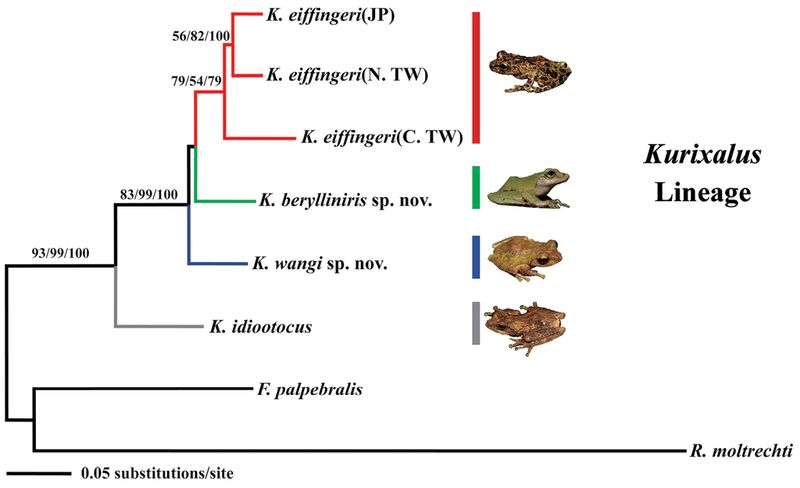 The Asian Tree Toad genus Pedostibes, as currently understood, exhibits a conspicuously disjunct distribution, posing several immediate questions relating to the biogeography and taxonomy of this poorly known group. The type species, Pedostibes tuberculosus and P. kempi, are known only from India, whereas P. hosii, P. rugosus, and P. everetti are restricted to Southeast Asia. 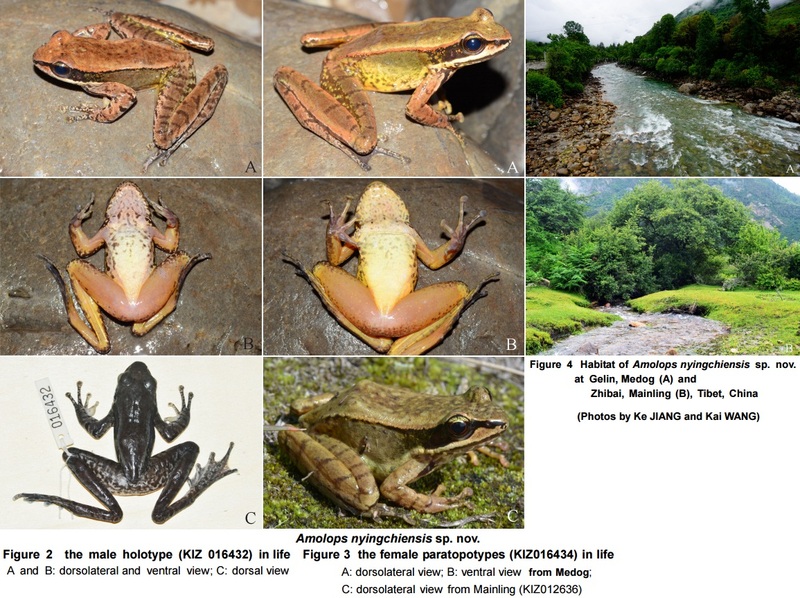 Several studies have shown that these allopatric groups are polyphyletic, with the Indian Pedostibes embedded within a primarily South Asian clade of toads, containing the genera Adenomus, Xanthophryne, and Duttaphrynus. Southeast Asian Pedostibes on the other hand, are nested within a Southeast Asian clade, which is the sister lineage to the Southeast Asian river toad genus Phrynoidis. We demonstrate that Indian and Southeast Asian Pedostibes are not only allopatric and polyphyletic, but also exhibit significant differences in morphology and reproductive mode, indicating that the Southeast Asian species’ are not congeneric with the true Pedostibes of India. As a taxonomic solution, we describe a new genus, Rentapia gen. nov. to accommodate the Southeast Asian species. Fig 1. Map showing distribution of species of Pedostibes and Rentapia gen. nov. Both ML and Bayesian phylogenies recovered similar topologies, with the ML tree providing better resolution at deeper nodes. Pedostibes tuberculosus was recovered as part of a primarily South Asian monophyletic clade, where it forms a sister lineage relationship to the clade that contains the genera Adenomus, Xanthophryne, and Duttaphrynus (Pedostibes + (Adenomus + (Xanthophryne + Duttaphrynus))). Males from this clade tend to be small in size with the exception of the genus Duttaphrynus. 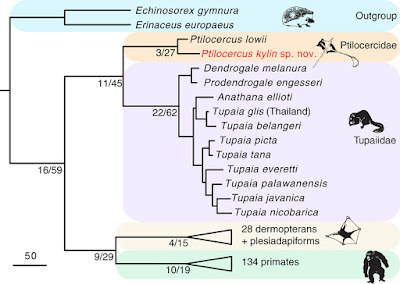 Southeast Asian ‘Pedostibes’ were reciprocally monophyletic with the genus Phrynoidis and represent a clade that exhibits the largest body size among all South and Southeast Asian toads (Fig 4; S2 Table). 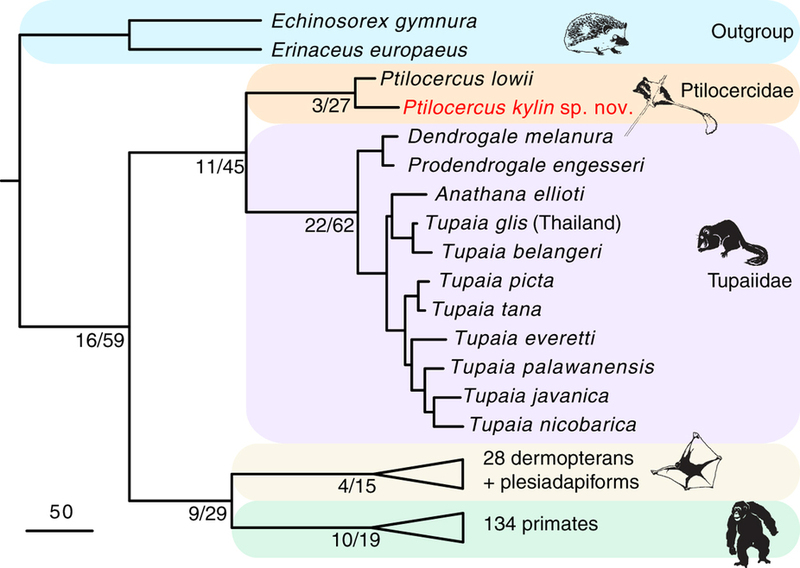 Uncorrected p-distances calculated from the mitochondrial alignment demonstrate that Southeast Asian ‘Pedostibes’ are 13–14% divergent from P. tuberculosus and 12–13% divergent from the genus Phrynoidis. These levels of divergences are consistent with other generic level divergences among South Asian, and Southeast Asian bufonids (Fig 5; S3 Table). Fig 4. Maximum likelihood phylogeny showing the polyphyletic relationship of Pedostibes and the proposed new genus among the South & Southeast Asian Bufonids. Diagnosis: Large-bodied toads with a movable coccyx, eight pre-sacral vertebrae, a complete quadratojugal, and small, pigmented ova laid as strings. Interorbital cranial crests absent. Parotoid glands large, distinct; oval, circular or triangular in dorsal view. Fingers webbed at base, tips expanded into flat discs. Feet fully webbed on all toes except fourth. Nuptial pads present in males. Adults are primarily arboreal and inhabit riparian vegetation around small- to moderately-sized forest streams. Phylogenetic definition: Rentapia is a node-based name that refers to the clade originating from the most recent common ancestor of ‘Pedostibes’ (Rentapia) hosii and ‘P.’ rugosus (Fig 4). Content: The allopatric species of Pedostibes of Southeast Asia from the Isthmus of Kra, Thailand and Peninsular Malaysia, Sumatra, and Borneo: Rentapia hosii and R. rugosus. We also tentatively place ‘P.’ everetti in Rentapia because of its close geographic proximity with the two Southeast Asian taxa, as well as the character state similarities it shares with R. rugosus (webbed hands and feet, finger and toe tips dilated into truncate disks, movable coccyx, eight pre-sacral vertebrae, complete quadratojugal). Etymology: The Iban are a subgroup of the indigenous peoples of Borneo (collectively known as the Dayaks) and form the main ethnic group in the Malaysian state of Sarawak. The generic epithet is selected to honor the legendary Iban warrior Libau Rentap, a great war chief, freedom fighter, and Malaysian national hero. Renowned for headhunting, the Iban were subjugated in Sarawak by the White Rajahs (English monarchy), who sought to confiscate land and impose taxes. Libau Rentap rose against the first of the White Rajahs, James Brooke, initiating a rebellion that eventually returned power to the people of Sarawak. The rule of the White Rajahs lasted from 1841 to 1946. Pedostibes is small in size and deposits medium-sized clutches of eggs that are laid as films. The combination of these traits differentiates it from Rentapia gen. nov., which is diagnosed by its larger body size and an oviposition mode characterized by a large clutch of eggs laid as strings. Given that individual egg sizes in both genera are comparatively similar, this agrees with past studies that show a close correlation of clutch size to female body size. There are also differences in sexually dimorphic traits. 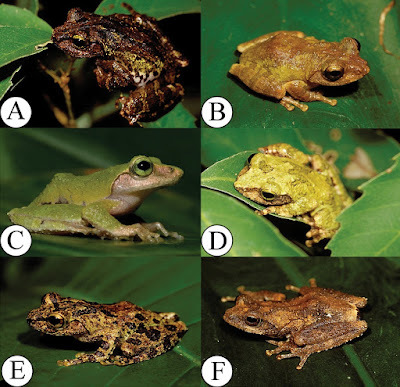 Both male and female Pedostibes have the same color pattern, whereas Rentapia hosii females are vividly colored with bright markings, as compared to the duller, uniformly colored males (Fig 6A–6C). However, this color dimorphism has so far been observed only in R. hosii and we do not have evidence for either R. rugosus or R. everetti having such color dimorphism. The most widespread Rentapia, R. hosii exhibits marked geographically based variation in female color pattern at different localities across its known distribution. Our analyses inferred a strongly supported genetic split between R. hosii populations from Peninsular Malaysia and those from Borneo. Additionally, females from these populations are phenotypically distinct. Females from Peninsular Malaysia are light green (dark gray when handled or stressed) with large, sparse, irregular yellow spots (Fig 6A–6C), whereas females from Borneo are purplish with yellow vermiculation or uniformly brown. Furthermore, a population from Danum Valley, Sabah, exhibits a phenotype that is distinct from populations from Peninsular Malaysia and the rest of Borneo. Females from Danum Valley have more dense dorsal vermiculations and broad, light-colored marbling on the flanks and posterior region of the thigh. The venter shows faint but distinct marbling whereas the venters of the former two populations are immaculate. However, the genetic divergences between Peninsular Malaysian and Bornean populations are low (2.6%) and more data are required to determine whether these populations represent distinct species. Since several recent studies have shown Pedostibes sensu lato to be a non-monophyletic genus within the family Bufonidae, suggested uniting Rentapia with its sister genus, the terrestrial river toad Phrynoidis, as a taxonomic solution. Although this suggestion would resolve the issue of monophyly, we find the recognition of the new genus to be a preferable solution based on several lines of reasoning. First, Rentapia and Phrynoidis exhibit striking morphological differences: Rentapia has expanded and flat finger discs (dilated into keratinized, bulbous tips in Phrynoidis); is considerably smaller in size (female Phrynoidis range from 120 mm to more than 200 mm SVL); lacks supernumerary palmar tubercles (present in Phrynoidis); possesses basal interphalangeal finger webbing (webbing absent in Phrynoidis); and the oral disk of Rentapia tadpoles is half the maximum width of the body (extends the entire width of the body in Phrynoidis). Striking ecological differences are equally apparent. Rentapia is an arboreal habitat specialist, whereas Phrynoidis are terrestrial riparian habitat generalists, that oviposits enormous clutches with an average size of 12,792 eggs per clutch; Finally, we note that genetic divergences of >12.0% (Fig 5) is consistent with other inter-generic divergences within Bufonidae, suggesting that our proposition is not discordant with other, accepted taxonomic arrangements. Although merging Rentapia and Phrynoidis would remedy the polyphyly of Pedostibes sensu lato, the preponderance of differences in morphology, reproductive characteristics, ecology, and molecular characters is best acknowledged by considering these two lineages as separate genera. Kin Onn Chan, L. Lee Grismer, Anil Zachariah, Rafe M. Brown and Robin Kurian Abraham. 2016. 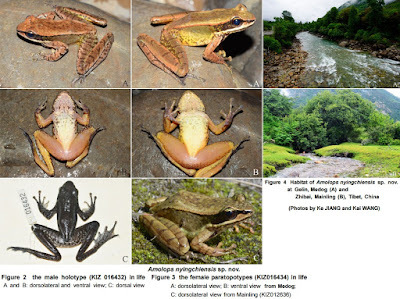 Polyphyly of Asian Tree Toads, Genus Pedostibes Günther, 1876 (Anura: Bufonidae), and the Description of A New Genus from Southeast Asia. A new species of the genus Amolops Cope, 1865 is described from Nyingchi, southeastern Tibet, China, based on morphological and molecular data. The new species, Amolops nyingchiensis sp. nov. is assigned to the Amolops monticola group based on its skin smooth, dorsolateral fold distinct, lateral side of head black, upper lip stripe white extending to the shoulder. Amolops nyingchiensis sp. nov. is distinguished from all other species of Amolops by the following combination of characters: (1) medium body size, SVL 48.5-58.3 mm in males, and 57.6-70.7 mm in females; (2) tympanum distinct, slightly larger than one third of the eye diameter; (3) a small tooth-like projection on anteromedial edge of mandible; (4) the absence of white spine on dorsal surface of body; (5) the presence of circummarginal groove on all fingers; (6) the presence of vomerine teeth; (7) background coloration of dorsal surface brown, lateral body gray with yellow; (8) the presence of transverse bands on the dorsal limbs; (9) the presence of nuptial pad on the first finger in males; (10) the absence of vocal sac in males. Taxonomic status of the populations that were previously identified to A. monticola from Tibet is also discussed. Etymology: The species name “nyingchiensis” is the Latin form of name of Nyingchi Prefecture, which includes the two localities of the new species. According to the Latin name, we suggest the English common name as “Nyingchi Cascade Frog”, and the Chinese common name as “Lin Zhi Tuan Wa” (林芝湍蛙). 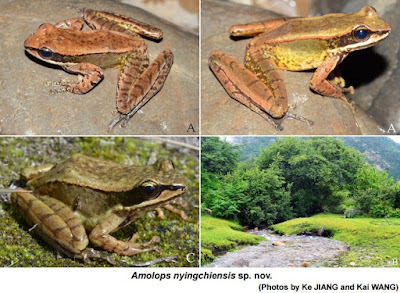 Ecological notes: The new species, A. nyinchiensis is found in the small to medium sized, fast flowing streams near mixed forest at relative high elevation (Figure 4). At the type locality (Gedang), the stream is much faster, and has rocky shores, while at the other locality (Zhibai) the stream is slower, and the shores are covered by vegetation and not rocky. Such distinct microhabitats suggest a wide ecological niche of the new species. 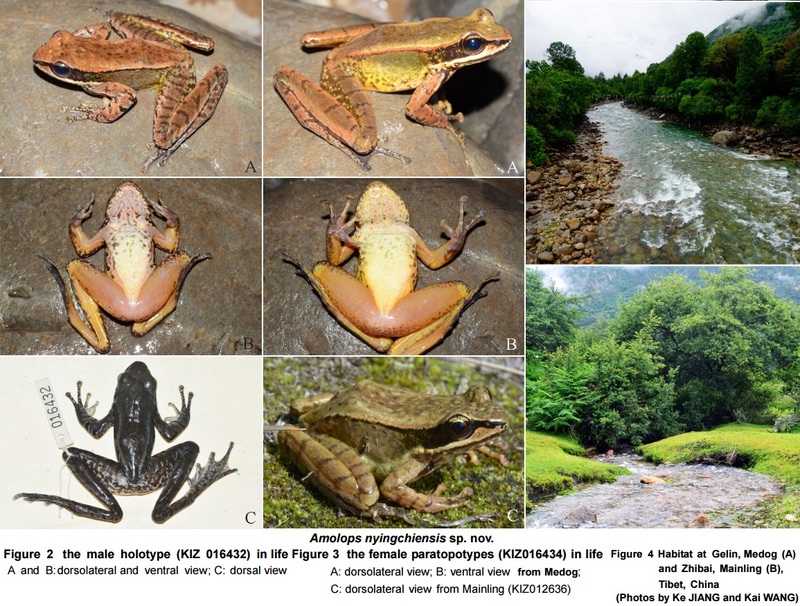 In Gedang, only the new species was observed, and in Zhibai, one amphibian species, Nanorana parkeri (Stejneger, 1927) was co-distributed with the new species, and one reptile species Pseudoxenodon macrops (Blyth, 1854) was also observed. Reproductive season of the new species is unknown. Figure 2 Different views of the male holotype (KIZ 016432) of Amolops nyingchiensis sp. nov. in life. A: dorsolateral view; B: ventral view; C: dorsal view. The Plain-backed Thrush Zoothera mollissima breeds in the Himalayas and mountains of central China. It was long considered conspecific with the Long-tailed Thrush Zoothera dixoni, until these were shown to be broadly sympatric. We revise the Z. mollissima–Z. dixoni complex by integrating morphological, acoustic, genetic (two mitochondrial and two nuclear markers), ecological and distributional datasets. In earlier field observations, we noted two very different song types of “Plain-backed” Thrush segregated by breeding habitat and elevation. Further integrative analyses congruently identify three groups: an alpine breeder in the Himalayas and Sichuan, China (“Alpine Thrush”); a forest breeder in the eastern Himalayas and northwest Yunnan (at least), China (“Himalayan Forest Thrush”); and a forest breeder in central Sichuan (“Sichuan Forest Thrush”). 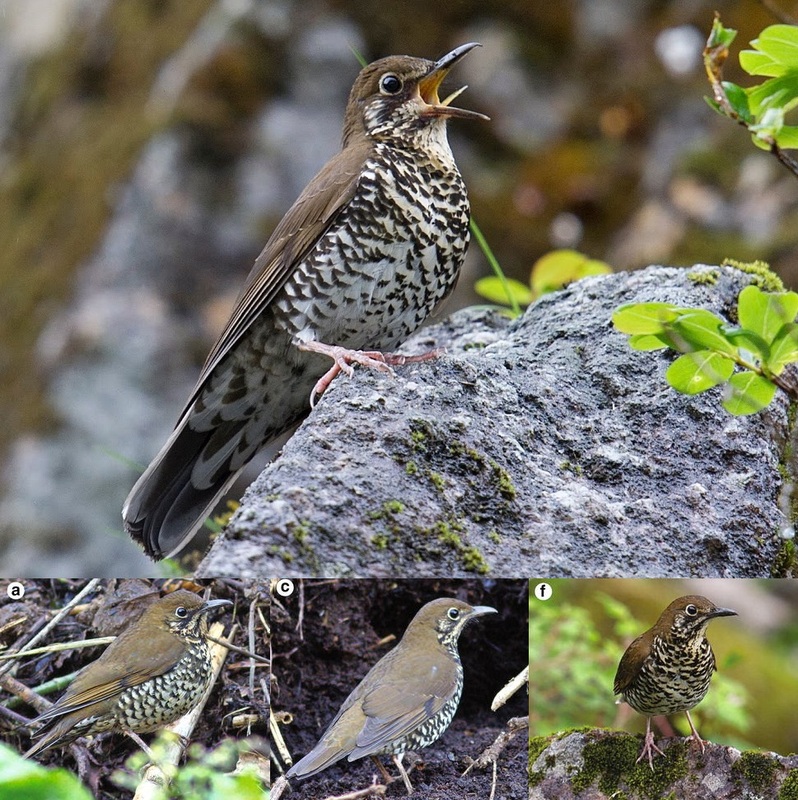 Alpine and Himalayan Forest Thrushes are broadly sympatric, but segregated by habitat and altitude, and the same is probably true also for Alpine and Sichuan Forest Thrushes. These three groups differ markedly in morphology and songs. In addition, DNA sequence data from three non-breeding specimens from Yunnan indicate that yet another lineage exists (“Yunnan Thrush”). However, we find no consistent morphological differences from Alpine Thrush, and its breeding range is unknown. 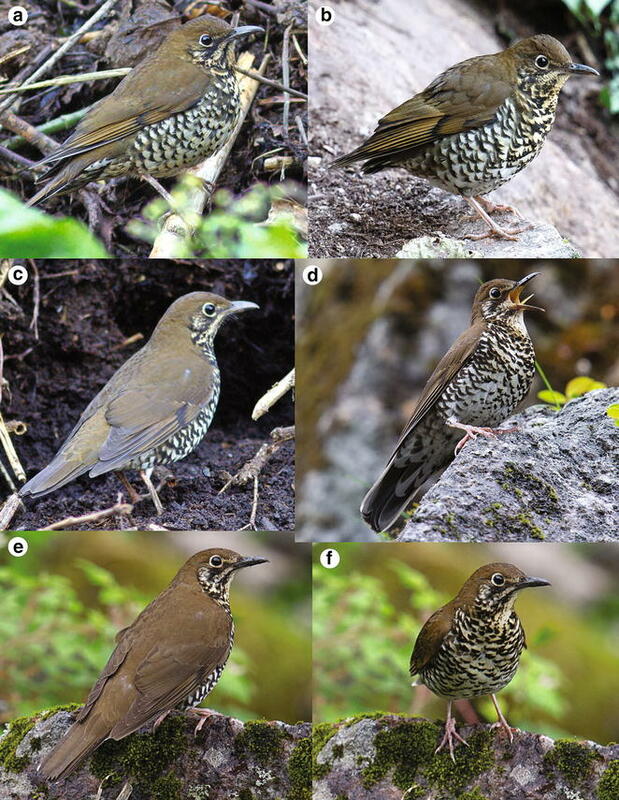 Molecular phylogenetic analyses suggest that all four groups diverged at least a few million years ago, and identify Alpine Thrush and the putative “Yunnan Thrush” as sisters, and the two forest taxa as sisters. Cytochrome b divergences among the four Z. mollissima sensu lato (s.l.) clades are similar to those between any of them and Z. dixoni, and exceed that between the two congeneric outgroup species. We lectotypify the name Oreocincla rostrata Hodgson, 1845 with the Z. mollissima sensu stricto (s.s.) specimen long considered its type. No available name unambiguously pertains to the Himalayan Forest Thrush. The Plain-backed Thrush Z. mollissima s.l. comprises at least three species: Alpine Thrush Z. mollissima s.s., with a widespread alpine breeding distribution; Sichuan Forest Thrush Z. griseiceps, breeding in central Sichuan forests; and Himalayan Forest Thrush, breeding in the eastern Himalayas and northwest Yunnan (at least), which is described herein as a new species. 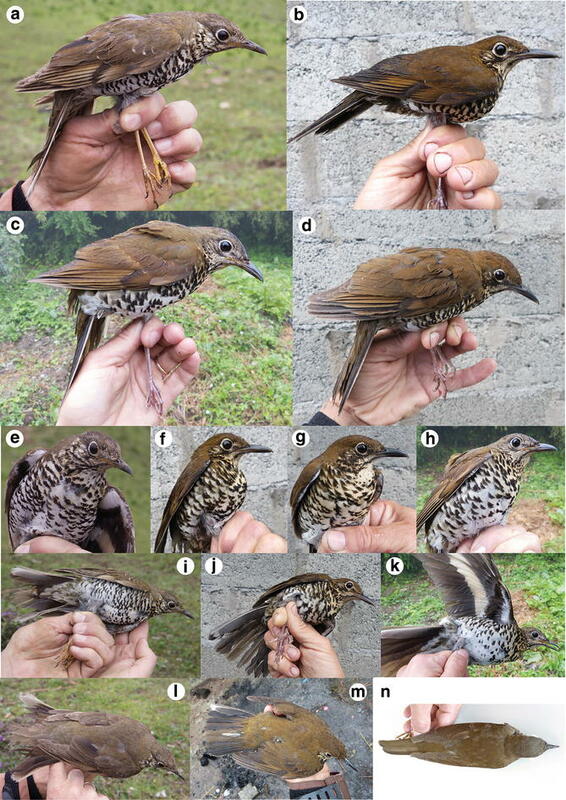 “Yunnan Thrush” requires further study. Etymology: We name this new species for Dr Sálim Ali, in honor of his huge contributions to the development of Indian ornithology and conservation. Status and conservation of all taxa: As the Alpine Thrush is widely distributed and its habitat is not under threat, it should be considered as being of least concern. Zoothera salimalii is locally common in West Bengal and Arunachal Pradesh, India, and locally abundant at Dulongjiang, Yunnan province, China. Because it is widely distributed and its habitat is not under any imminent threat (other than forest areas in general), it should be considered as being of least concern. Zoothera griseiceps is only known to breed in a rather small area in Sichuan province, China. However, as it is locally fairly common, and occurs in several protected areas, it is probably not under any imminent threat, at least not on its breeding grounds. 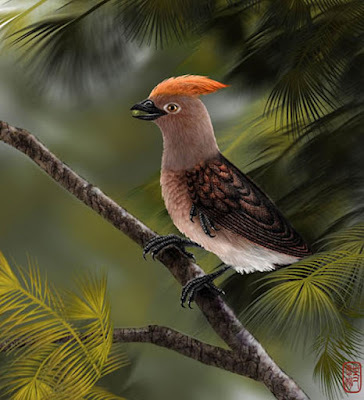 Based on analyses of plumage, morphometrics, mitochondrial and nuclear DNA, song, breeding habitat and geographical distributions, we conclude that Zoothera mollissima s.l. 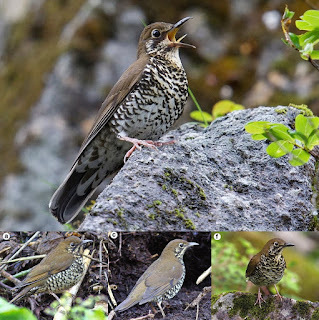 should be split into at least three species, one of which is described here as a new species: Alpine Thrush Z. mollissima s.s., Himalayan Thrush Zoothera salimalii (sp. nov.) and Sichuan Forest Thrush Z. griseiceps, all monotypic. 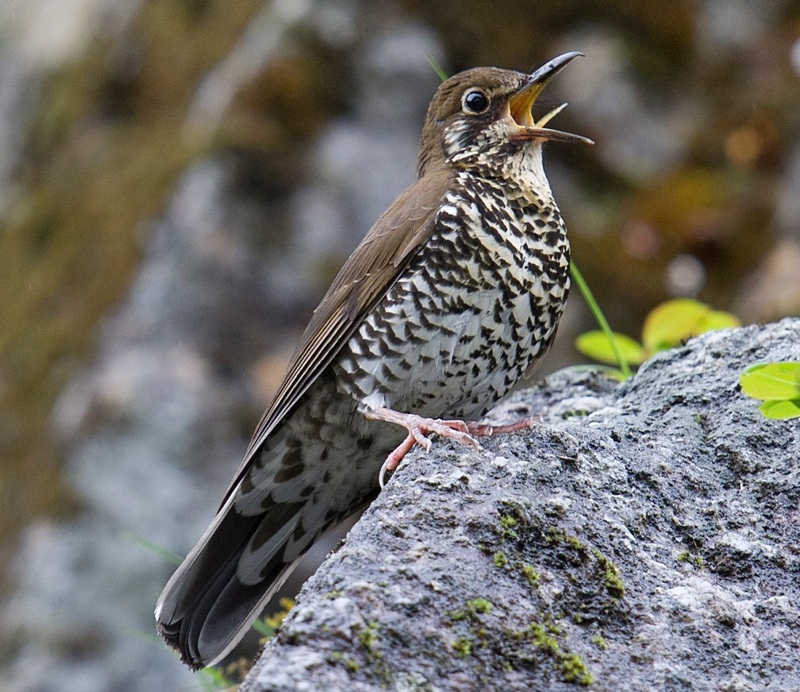 In addition, a distinct lineage, “Yunnan Thrush”, was identified genetically, but as we have no corroborating evidence that it is distinct from Alpine Thrush, we refrain from describing it here. Z. dixoni should be retained as a distinct species. Per Alström, Pamela C. Rasmussen, Chao Zhao, Jingzi Xu, Shashank Dalvi, Tianlong Cai, Yuyan Guan, Ruiying Zhang, Mikhail V. Kalyakin, Fumin Lei and Urban Olsson. 2016. Integrative Taxonomy of the Plain-backed Thrush (Zoothera mollissima) complex (Aves, Turdidae) reveals Cryptic Species, including A New Species. : A new species of bird has been described in north-eastern India and adjacent parts of China by a team of scientists. 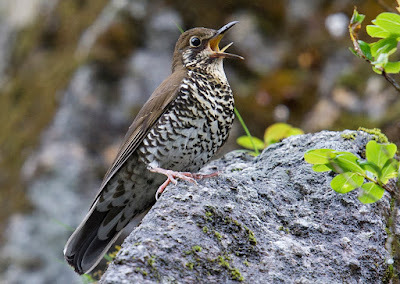 The bird has been named the Himalayan Forest Thrush, Zoothera salimalii. Eotrachodon orientalis gen. et sp. nov. (latest Santonian of Alabama, southeastern U.S.A.) is one of the oldest and most basal hadrosaurid dinosaurs and the only hadrosaurid from Appalachia (present day eastern North America) with a preserved skull. This taxon possesses a relatively derived narial structure that was until now regarded as synapomorphic for saurolophine (solid-crested or crestless) hadrosaurids. 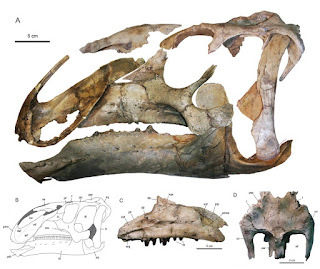 Maximum parsimony analysis places E. orientalis as the sister taxon to Saurolophidae (Saurolophinae + Lambeosaurinae). Character optimization on the phylogeny indicates that the saurolophine-like circumnarial structure evolved by the Santonian following the split between saurolophines and lambeosaurines but prior to the major hadrosaurid radiation. Statistical dispersal-vicariance analysis posits an Appalachian ancestral area for Hadrosauridae and subsequent dispersal of their ancestors into Laramidia (present-day western North America) during the Cenomanian.